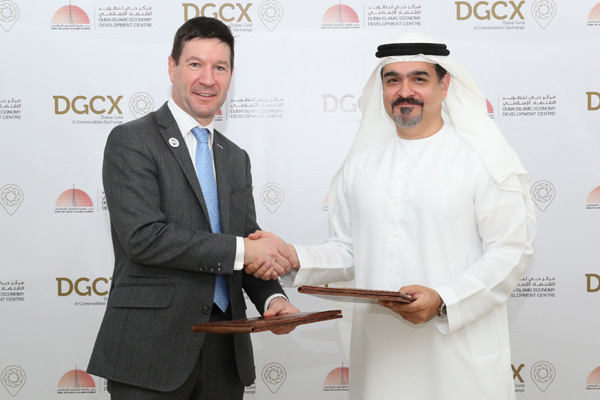 The Dubai Gold and Commodities Exchange (DGCX) and the Dubai Islamic Economy Development Centre (DIEDC) have signed a MoU to share knowledge, promote shari’ah compliant finance, and help foster Dubai as the global capital of Islamic economy. As per the agreement, DIEDC will work with DGCX to promote the shari’ah compliant spot gold contract, as well as any other such commodity products subsequently developed by the exchange to cater to the Islamic finance sector, while positioning Dubai as the hub of the Islamic economy, remarked Abdulla Mohammed Al Awar, the chief executive of DIEDC after signing the deal with Les Male, chief executive officer of DGCX. “In line with our shared goal to transform Dubai into the global capital of Islamic economy, this partnership articulates the commitment of our organisation to connect relevant stakeholders of the Islamic economy, and transfer knowledge about Islamic finance instruments, such as Shari’ah Compliant gold and commodity trading,” stated Al Awar. “Encouragingly, these instruments are witnessing a high uptake in servicing the growing Islamic finance sector,” he added.